It’s always amazing when a celebrity takes time out of their day to say thank you. The Golden Goose nest almost exploded with excitement when we received a letter from Dame Judi Dench thanking us for her Fujifilm digital camera. 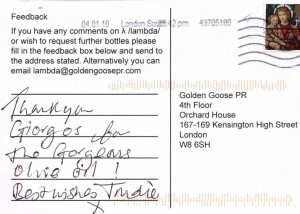 And now, just today, we received a thank you postcard from Trudie Styler, who received and loved her bottle of /lambda/ olive oil, which we posted to her in time for Christmas. And what’s not to love about this delicious cold pressed olive oil, made with plump, peppery, hand-picked olives from Greece? If it’s good enough for Trudie…!